Discussions with women, about women and the all mighty dollar. 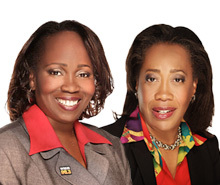 “Beyond the Bling… Financial Wisdom for Women” is a 30‐minute talk show designed to provide women with the resources they need to build financial wealth. Hosted by veteran newswoman Renee Nash and financial guru Muriel Garr, “Beyond the Bling” is quick moving, witty, in your face and no holds bar discussions from women and about women on the all mighty dollar. Each week, Renee and Muriel will feature women experts who will share their expertise as well as life experiences on how to properly manage money. Topics will include things like how to set‐up a checking account, home buying, retirement and estate planning, credit building, building financial wealth, tax tips, healthcare, psychological spending, taking your car to the shop without getting taken, and many more. “Beyond the Bling” will take the mystery and anxiety out of financial matters for women who many times are living paycheck to paycheck.